The image above is a manifestation of something called The Exceptional Lie Group E8. I can't even begin to extrapolate the information from the scientific website. I believe it's the computer-generated representation of a formula, which would fill all the blackboards in Manhattan, that has something to do with multiple dimensions and the theory of everything. Or perhaps it's the mathematical formula for Marshmallow Fluff. All I care is that it's a staggeringly beautiful image. And--guess what?--it looks like nothing so much as an equally staggering work below by Mark Dagley, taken from the McKenzie Fine Art website. Dagley's work is from 1999, and the formula is more recent. If Dagley somehow imagined the form before the math produced it, well I'm thinking he's got a big career in physics. And if the math came before the art, Dagley's drawing is a beautiful and mindblowingly complex image that connects the artist with nature of the universe in a way rarely before imagined. Do you remember the Spirograph sets that we had as kids - well I had one- you might be too young? Same principal. Points along an arc connected through a regular function of some sort. Perhaps that is one reason I'm not overly impressed with any of these works - I could and did do similar ones with my Spirograph set 40 years ago. And so did every other kid who had a Spirograph. I'm with Jan on this one. I do admire the obsessiveness and care with which the image had been rendered -- a lot of hours were spent in front of that piece of paper! And there's a certain appeal to highly symmetrical images such as this one. But it's not on my top ten works of art of the week. Sometime I like to shed my cynicism and dig an image. The top image is the visual manifestation of a mathematical equation! Maybe it's because I'm in the minus 100% percentile of math ability, but an image generated purely via numbers (as opposed to the way computers reconstitute images via ones and zeros) is magic to me. 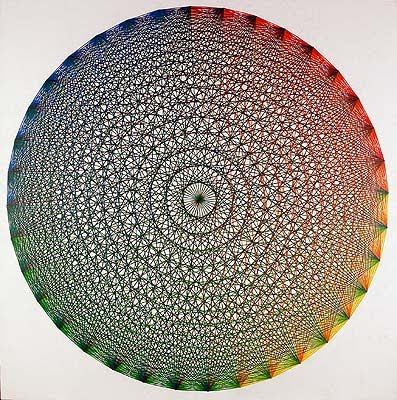 And the fact that math and art overlap so beautifully is another little bit of magic. I'm holding on to that, Spirographs be damned. It's all a bunch of hoopla. I do love mandalas, Diana. But I think you've missed my point. Every composition can be translated into mathematics- Ratios, proportions and geometries all play a role in making a cohesive piece. In a way, every painting has is own unique formula. Isn't it enough sometimes to just have a gee whiz response to a painting, piece of music, crack in a plaster wall...... and then revel in it? Hee Sung Lee is self taught artist and certainly not a mathmatician. The image if you take a closer look is made up of sancrit Om. jan, you could make a 5 feet x 5 feet work like this, with a dinky plastic spirograph, as a child? please. you wouldn't even have the wingspan to connect the dots. 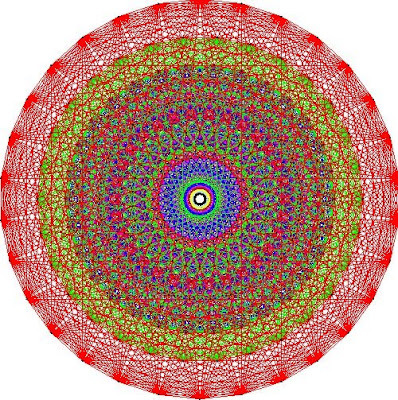 even if spirograph/math/mandala-inspired, this is still ridiculously impressive. just in hand-eye precision alone.... not to mention its dizzying visual appeal (if that's allowed to count for anything). It gets better. In 2007 a 39-year-old surfer in Hawaii mapped elementary particles and physical forces to the E8 in a way that accounts for gravity, which has been the sticking point. He has predicted the existence of particles that they're going to be looking for in the results of the Large Hadron Collider. Allison - Not only did I make images very similar to the one shown, I did a whole project for my French class in this methodology. I used nails and string to make a French chateau picture. It really isn't that impressive if you understand the principal behind it. But isn't that true of most things - when you understand how they work, they cease to hold you.